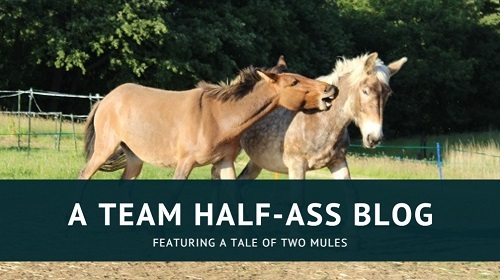 Hurrah, I have another Mule Tales to bring you! 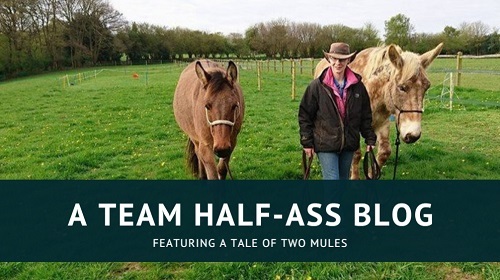 I get ridiculously excited when I have a story to share (please consider donating generously to the Crazy Mule Lady fund: do you own a mule? Would you like to talk about him/her? Then please contact me via email, Facebook, blog comment or neigh-bray!). 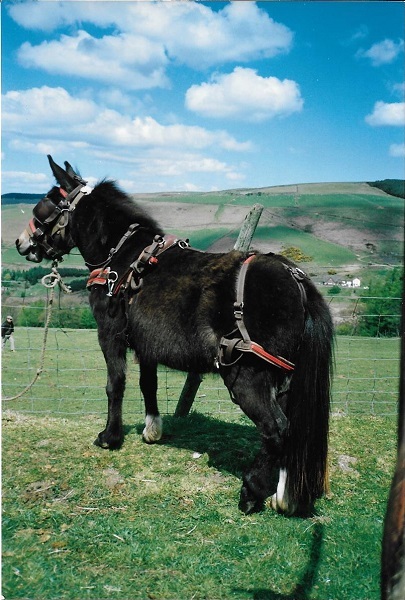 We have another UK mule for you this week, a Shetland cross named Charcoal who has seen and done it all! 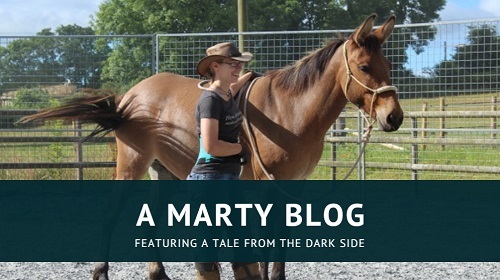 At 28 she’s our oldest Mule Tale so far, but remember that mules are longer lived than horses – many mules remain working well into their 30s, and can easily live until their 50s (this means that, all being well, I will still be riding Marty when I’m 50!). 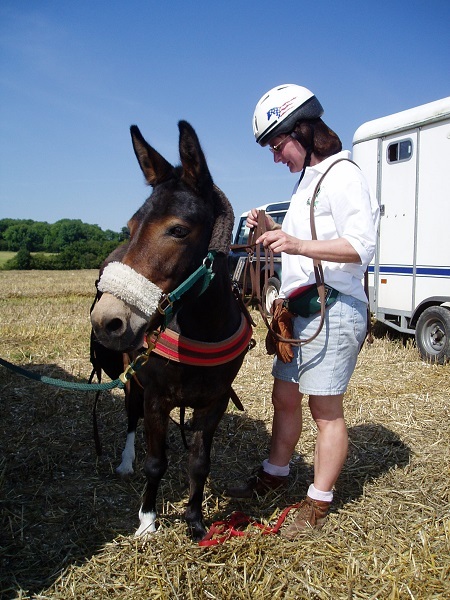 Many thanks to Ruth for sharing her mule’s story with us. British Mule Society members will be able to read more about Charcoal, and hear about Ruth’s time spent riding with Meredith Hodges, in the latest issue of the BMS journal. My mule is a Shetland standing 10hh and now 28 years old. Her name is Charcoal, for you end up with black fingers after giving her a scratch. Her favourite pastimes are hedge pruning and rolling on any loose grit on the road. Unfortunately she suffers with sweet-itch so spends March to October in a Boett looking like a pantomime donkey. I met her across the road from the gypsy camp in 1989 following a phone call from my Aunt. Charcoal was long reined for several years until kindly John Rolling gave us a little exercise vehicle. 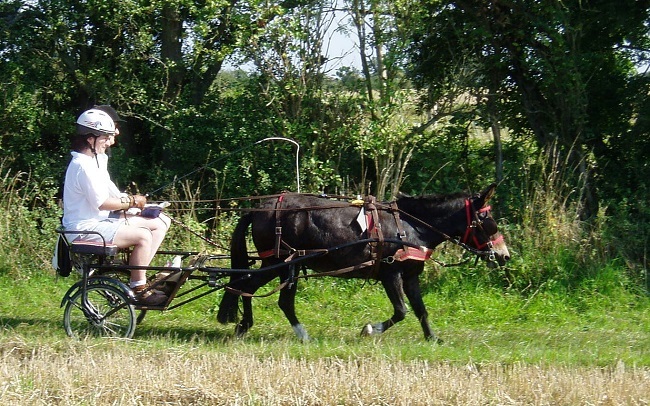 I took carriage driving lessons in 2000 and we attended a few local BDS drives. The highlight of our driving was an RDA fundraiser at Windsor Great Park in 2005 put to a Ken Jackson gig. We also took part in ‘le trec’ at Newbury Showground. The main restriction has always been a lack of transport, so boxes were hired, including to attend a Mule Camp weekend in Kent. The first event we ever went to was an Easter parade in Reading. It was funny as Charcoal kept staring at the mule reflection in various windows on route! In 1992 she spent a week or two in Wales, Jon Green ‘putting her to’ and getting us going driving plus doing a spot on his Mule Video. 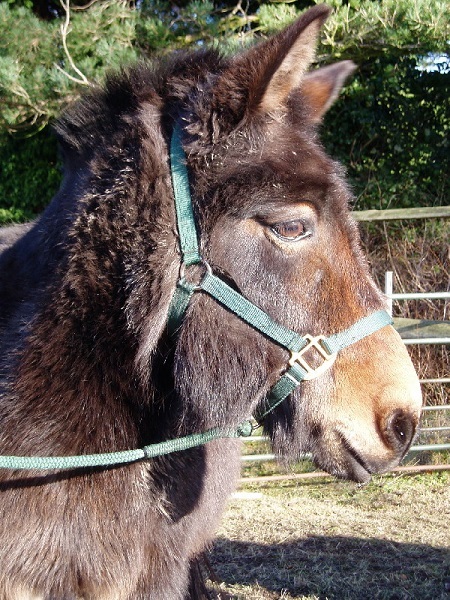 It wasn’t long before another mule came along, ‘Beau’ rescued from the New Forest. After getting him wormed and trimmed he was foster-cared for by Jon until his owner was well again. Then ‘True’ via word of mouth from the farrier, “if you can load it you can take it”, who was brought on then eventually sold to the Farmer family. Lastly Penny purchased from the Reading Sales who kept Charcoal company whilst I was doing my apprenticeship. After returning from the Lucky Three ranch, when I went to Hartpury college Charcoal and Penny came too. 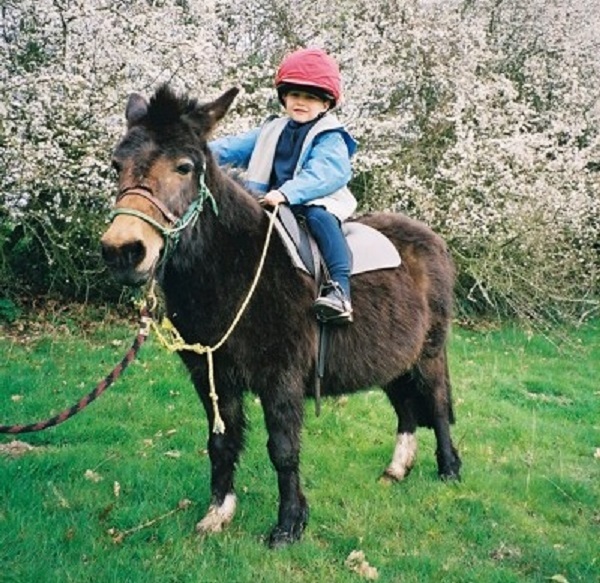 Once I moved to the US Charcoal was entrusted to Gill Herriott, living with Muffin who was very enamoured with her, then going on loan to Carla Phillips to give children’s rides and (in theory) pull Thomas the tank. In 1999 Charcoal came back and Alex was two so he was able to sit on during walks. Currently my two nieces who are eight and ten are keen to come out again as they did last summer. The most important thing is not to lose your patience. If you are in a no win situation walk away. Charcoal was quite nappy at first especially when she lived alone if we came across other equines. A few times I just had to tie her up (to something solid) and take a time-out! If you would like your mule to be featured here, then please contact me either via this blog, message me on my Mulography Facebook page, or email me at: herecirm (at) gmail.com. I would particularly like to hear from UK mule owners (purely because Mulography is about owning a mule in the UK), but am very happy to take worldwide submissions!